CONDEMNATION AND CONSTRUCTION: The Gowanus Expressway, which serves as the southern extension of the Brooklyn-Queens Expressway, also connects the Brooklyn-Battery Tunnel approach, the Prospect Expressway (NY 27), the Belt Parkway and the Verrazano-Narrows Bridge. 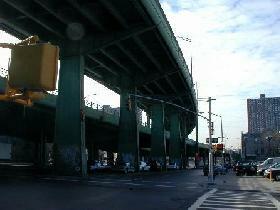 Although guide signs and maps refer to this segment of I-278 as the Brooklyn-Queens Expressway, it is known locally as the Gowanus Expressway. However, the Gowanus Parkway would require more land for a wide roadway and entrance-exit ramps. This required the demolition of many homes and businesses along Third Avenue, a tightly knit block of Northern and Western European immigrants. In his 1974 biography The Power Broker, Robert A. Caro argued that Moses' highway created a "Chinese wall" that accelerated the process of deterioration that began two blocks west, along the waterfront terminals. He also points out that residents fought to have the highway placed closer to the waterfront to protect the neighborhood. The Gowanus Parkway project, including the widened Third Avenue for local truck traffic, was completed on October 1, 1941. On August 27, 1942, the Hamilton Avenue Drawbridge, which consists of two side-by-side bascule spans over the Gowanus Canal, was opened to traffic, providing a direct connection from the northern terminus of the Gowanus Parkway to the Red Hook section of Brooklyn and points north. The twin 546-foot-long spans, which are still operated and maintained by the New York City Department of Transportation (NYCDOT), each feature a single 80-foot-leaf, and carry three lanes of traffic in each direction. When the Gowanus project opened, it was part of the "Circumferential" (Belt) Parkway that carried the NY 27A designation. In 1955, both the Triborough Bridge and Tunnel Authority (TBTA) and the Federal Bureau of Public Roads (BPR) recommended that the existing Gowanus Parkway be converted to an expressway, and that the route be included in the national Interstate highway network. Two years later, the Board of Estimate approved the expansion of the existing four-lane parkway into a six-lane expressway, providing access to the proposed Verrazano-Narrows Bridge. The expansion, which was financed under the Federal-aid Interstate system (and given the designation I-278), was part of an overall plan to provide access to the proposed Verrazano-Narrows Bridge. Soon after the expressway conversion was approved, work began on widening the elevated section from two to three lanes in each direction, and eliminating some entrance and exit ramps. More demolition was required along the Third Avenue corridor: approximately 200 buildings were condemned for the expressway expansion. Further south, the newly christened "Gowanus Expressway" was extended from the western terminus of the Belt Parkway to the Verrazano-Narrows Bridge, despite vociferous protests by Bay Ridge residents. According to the Joint Study of Arterial Facilities conducted in the mid-1950's by the TBTA and the Port Authority of New York, the original plan for the Bay Ridge section called for twelve lanes in a "3-3-3-3" configuration. This was because in this section, there was to have been an interchange with the Cross Brooklyn Expressway, which was also to serve as a feeder route to the bridge. To address the concerns of Bay Ridge residents, the Gowanus Expressway was reduced from twelve to six lanes (three in each direction) in this area, while the Cross Brooklyn Expressway was never built. Nevertheless, some 800 buildings were torn down, and approximately 7,000 Bay Ridge residents were displaced for this eastern bridge approach. The Gowanus Expressway widening project and Bay Ridge bridge approach were completed in 1964 at a cost of $100 million. Despite this upgrade, most of the expressway reflects pre-Interstate era design standards. The lack of shoulders, inadequate acceleration and deceleration lanes, tight curves and limited sight distances characterize the route, particularly on its elevated sections. Few people would disagree with the notion that the deterioration needs to be fixed quickly. Indeed, the parallels between the West Side Highway in Manhattan of the early 1970's and the Gowanus Expressway today are uncanny. The West Side Highway then, and the Gowanus now, each were elevated arterial roadways providing vital highway connections close to the waterfront that exceeded 50 years in age. Both had been pounded during their useful lives by wind, rain, snow, sea air humidity and salt, not to mention vehicular traffic, and were known to be in a deteriorated condition. Will a dump truck filled with construction materials en route to a patch job fall through the Gowanus to the street below as happened on the West Side Highway in 1973? The Gowanus Expressway also serves as a "southern bypass" truck route from New Jersey and points south around New York City to Long Island. More than ten percent of the vehicles on the expressway are through-traffic trucks. HOV ON THE GOWANUS: By the 1990's, the Gowanus Expressway handled approximately 175,000 vehicles per day (AADT), prompting the New York State Department of Transportation (NYSDOT) to implement HOV lanes to ease congestion. Currently, one eastbound (northbound) lane of the Gowanus Expressway is dedicated for carpools and express buses with EZ-Pass tags. The HOV lane, which begins at the Belt Parkway and serves traffic exclusively bound for the Brooklyn-Battery Tunnel (I-478), has so far been successful. According to a 1997 study conducted by the New York State Department of Transportation (NYSDOT), an average of 1,210 vehicles carrying 11,000 people, or 9.1 persons per vehicle, traveled in the HOV lane per hour during the morning rush. This compares with 1,625 people in 1,290 vehicles, or 1.25 persons per vehicle, in the general-use lanes per hour during the morning rush. In an effort to improve flow on the HOV lane, the NYCDOT announced plans recently to change the restriction from HOV-2 to HOV-3, meaning that vehicles now need at least three occupants to use the lane. However, the HOV lane does not come without its cost. During the morning peak hours, access from the westbound / southbound Gowanus Expressway to EXIT 24 (NY 27 / Prospect Expressway) is blocked by a moveable barrier, which is used to separate westbound / southbound traffic from the eastbound / northbound Gowanus HOV lane. Interim emergency repairs to the viaduct superstructure and roadway deck from the Belt Parkway terminus east (north) to the Brooklyn-Battery Tunnel (I-478). The $107 million project, which included the installation of a variable message system, was completed in 2003. Reconstruction of the section from the Belt Parkway terminus west (south) to the Verrazano-Narrows Bridge. The $49 million project was completed in 2004. ADDRESSING DETERIORATION AND CONGESTION: Responding to congestion and safety concerns, as well as to concerns over the structural integrity of the elevated roadway, the NYSDOT began considering options to improve the Gowanus Expressway corridor in the early 1990's. The NYSDOT sought to make the Gowanus Expressway structurally and seismically sound, increase its durability and ease of maintenance, improve traffic flow (both on the expressway and on local streets), and expand mass transit alternatives along the expressway. ALTERNATIVE 1: No build / maintenance: $375 million (not including cost of future rehabilitation or replacement); continuous work. ALTERNATIVE 2: Rehabilitation with operational and safety improvements: $598 million; expected to take six and one-half years. ALTERNATIVE 3: Reconstruction of elevated structure along existing alignment: $1.39 billion; expected to take seven and one-half years. ALTERNATIVE 4: Reconstruction of Gowanus Expressway along new alignment: $1.86 billion; expected to take six and one-half years. ALTERNATIVE 5: Reconstruction as an at-grade, controlled-access Interstate highway (with removal of elevated structure): $911 million; expected to take six and one-half years. ALTERNATIVE 6A: Eliminating the expressway, and providing an at-grade arterial (boulevard) within the existing Gowanus right-of-way: $656 million, expected to take six and one-half years. ALTERNATIVE 6B: Eliminating the expressway, and providing an at-grade arterial (boulevard) and a light rail line within the existing Gowanus right-of-way: $2.1 billion, expected to take eight and one-half years. The NYSDOT recommended "Alternative 2," much to the disappointment of community groups that sought to address the Gowanus Expressway reconstruction as an opportunity to address wider concerns such as economic and neighborhood development. INTRODUCING THE GOWANUS TUNNEL: In 1997, the Regional Plan Association (RPA) released a report paid by the New York City Council indicating that a tunnel to replace the elevated Gowanus Expressway was not only technically feasible, but also desirable aesthetically to surrounding communities. The tunnel would begin at the intersection of the Gowanus Expressway, Belt Parkway and the Verrazano-Narrows Bridge approach (I-278) in Bay Ridge. The Gowanus Tunnel would continue north through Sunset Park and under the Gowanus Canal to Red Hook, terminating at the Brooklyn-Queens Expressway (I-278) and the Brooklyn-Battery Tunnel approach (I-478). Under the RPA plan, the increased space provided by the demolition of the elevated Gowanus Expressway would be used to develop a tree-lined boulevard along Third Avenue. Eventually, esplanades and parks would be created along the Bay Ridge, Sunset Park and Red Hook waterfronts. Four inbound (eastbound) and three westbound (outbound) lanes would be provided through the tunnel. One lane in the eastbound direction would be established for HOV use during peak periods. New interchanges would be constructed so as to minimize weaving problems. There are to be new underground grade-separated interchanges at the Belt Parkway, Prospect Expressway (NY 27) and the Brooklyn-Battery Tunnel (I-478), and reconstruction of existing highway approaches to the Gowanus Tunnel. Eight of the 13 alternatives provide a new underground trumpet interchange in the vicinity of 39th Street to serve the Sunset Park area. Two of the 13 alternatives provide a 9,250-foot-long deepwater tunnel beneath the Brooklyn piers. The tunnel would be constructed at least 75 feet beneath the surface to permit operation of the deepwater port. The NYSDOT prepared a comprehensive environmental impact statement to determine the best way to improve the expressway, and in 2006 gave preliminary approval to build a 3.5-mile-long, seven-lane tunnel costing an estimated $12.8 billion. Before any construction takes place, a number of obstacles from existing utility and sewer lines to the placement of a cross-harbor freight rail tunnel, need to be taken into account. Finally, if a tunnel were to be built, one or more methods - bored tunnel, cut-and-cover tunnel or immersed tunnel - may be used. The tunnel would be scheduled for completion by 2020. Replacing the Gowanus Expressway with a tunnel would be cheaper in the long run than rebuilding the crumbling elevated highway and would revive moribund neighborhoods in southwest Brooklyn, according to a study by a regional planning group. The study by the Regional Plan Association found that it would cost $2.4 billion to build the tunnel, compared with the $1.0 billion it would take to shore up the aging highway, a major transportation link used by about 175,000 vehicles a day. But the planning group said the underground road would cost far less to maintain, saving tens of millions a year in repair and reconstruction costs. In addition, a tunnel would allow the city to reclaim waterfronts in Bay Ridge and Red Hook that could be used for esplanades, parks or light-rail systems. The study cited similar projects in cities -- from Boston to Oslo -- in which congested surface or elevated roads are being replaced with tunnels. The state has set aside $750 million, mostly in Federal funds, for the 3.8-mile elevated part of the Gowanus, but officials say no decision has been made on whether the money will be spent on overhauling the highway or building a tunnel. "If this turns out to be the best option, we'll go with it," said Alex Dudley, a spokesman for the state Department of Transportation. "We've made no decision on which way to go." There is an urgent need to do something about the Gowanus, a crumbling, obsolete 1940's six-lane elevated expressway along the South Brooklyn waterfront that is New York City's principal link southward to the Interstate system, one that carries 50 million cars and four million trucks a year. But plans to rebuild the elevated expressway have stalled over widespread concerns about the consequences of diverting up to 4,000 vehicles an hour for over five years onto narrow, local Brooklyn streets. Moreover, spending up to $1 billion in Federal and State funds and enduring up to a decade of costly traffic and community misery to wind up with nothing more than a rebuilt version of an inadequate and obsolete roadway is not the path to future prosperity for either the region or the country. A tunnel could similarly be the win-win solution the Gowanus corridor needs. A tunnel can provide the new, modern Interstate facility the Gowanus corridor must have. A tunnel would permit the Gowanus Expressway to operate at full capacity while it was being built, eliminating years of massive disruption of local communities. And when the tunnel was completed, the Gowanus could be torn down, reuniting South Brooklyn's neighborhoods and opening up its waterfront, and spurring local economic revitalization. In its 1999 research paper, "How To Build Our Way Out of Congestion," the Reason Public Policy Institute advocated replacing the elevated sections of the Gowanus Expressway with a tunnel, citing high land values and local antagonism in the area. The proposed tunnel, which would be based on the new Paris "Metroroutes," would allow urban buses and most fire equipment, but not heavy trucks or long-distance coaches. Nevertheless, smaller vehicles that constitute more than 90 percent of rush-hour traffic flows would be permitted, allowing for considerable cost savings. Tunnels are expensive to build. Worse yet, they always seem to end up costing a lot more than anyone predicted at the start. Bridges are also expensive, but typically not as expensive as a tunnel. 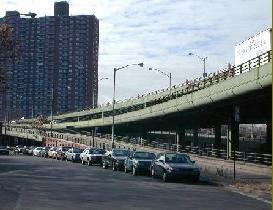 The Gowanus Expressway, or at least an elevated three-mile section of it, is a bridge. In fact, it is the longest bridge in New York City. And it is falling apart. The last time an elevated highway collapsed in New York City, a tunnel was proposed to replace it. That proposed project -- called Westway -- never did get built, but New Yorkers remember the huge amounts of time, energy and money wasted in the attempt. Yet the Regional Plan Association (RPA), an influential private planning organization, is now proposing that a tunnel be built to replace the decaying section of the Gowanus. It argues that a tunnel would have a less negative impact on the surrounding neighborhoods than the elevated highway. Agreed, but there is a question of cost. The RPA says it will cost between $1.5 billion and $2.5 billion for the tunnel, or two to three times the estimated $750 million to rebuild the elevated expressway. The state Department of Transportation says a tunnel will cost even more: between $6 billion and $9 billion. Whom should we believe? In one sense, it doesn't matter, because the RPA's lowball number is already too high to be justified. The extra money spent building a tunnel here means that other deserving projects would be delayed or forgone altogether. New York cannot afford to ignore its other highways and roads for the sake of a tunnel along this three-mile stretch of expressway. If the "Chunnel" and "Big Dig" are any indication, there is every reason to believe that a Gowanus tunnel will cost more than either the RPA or the state estimate. Rather than waste valuable public monies to prove the obvious, the RPA should withdraw its proposal. The people of New York would do better to upgrade the existing elevated expressway and to use the additional money for the many other roadway projects it so desperately needs. Sometimes, many "little digs" make more sense than a big one, especially when the one "big dig" will bury the rest. In 2008, the American Institute of Architects (AIA) recommended its own alternative to the Gowanus Tunnel. The AIA recommends tearing down the existing viaduct along Third Avenue and building a new cable-stayed "signature span" along First Avenue that would provide sweeping views of New York Harbor. It also proposes adding new parks and trails along Third Avenue where the expressway now stands. TIME FOR A TUNNEL: The Gowanus Expressway Tunnel proposal is one that deserves serious consideration. If the Central Artery (I-93) tunnel is indeed successful in uniting parts of Boston that had been separated when the elevated expressway was constructed, it will usher in a new era of highway construction across North America. As current urban Interstate highways reach the end of their useful lives, new expressways that are sensitive to the needs of communities and the environments should be seriously considered. The proposed three-tube, nine-lane Gowanus Tunnel, which would be based on the Saunders-Herrenknecht dual-deck tunnel model once planned for the Tappan Zee and Oyster Bay-Rye crossings, would run from the existing western terminus of the Belt Parkway to the Brooklyn-Battery Tunnel approach (I-478). The upper level of the outer tubes would be used for general-use traffic, while the upper level of the center tube would be used for peak-direction traffic (and may possibly be reserved for reversible HOV use). The bottom level of the tubes may be used for new subway tunnels, possibly for a future express subway line to Staten Island. Above ground, connections would be provided at EXIT 22 (Belt Parkway), EXIT 23 (38th Street), EXIT 24 (NY 27 / Prospect Expressway) and EXIT 25 (I-478 / Brooklyn-Battery Tunnel). Finally, ventilation buildings would blend into the rejuvenated neighborhoods, and parkland would be provided. Finally, "NORTH" and "SOUTH" direction plates should be used for the Gowanus Expressway portion of I-278. Through Brooklyn and Queens, Interstate 278 actually runs north-south, not east-west. SOURCES: New Parkways in New York City, New York City Department of Parks and Recreation (1937); "More Moses Loops Form," The New York Times (6/29/1941); Joint Study of Arterial Facilities, The Port of New York Authority and the Triborough Bridge and Tunnel Authority (1955); "Span Approaches Approved by City" by Charles G. Bennett, The New York Times (6/20/1957); "Hour Will Be Cut for Some Trips" by Joseph C. Ingraham, The New York Times (11/21/1964); Arterial Progress 1959-1965, Triborough Bridge and Tunnel Authority (1965); The Power Broker by Robert A. Caro, Vintage Books-Random House (1974); "Reconstructing the Gowanus: A Tunnel Is a Realistic Alternative to the Elevated Roadway" by Peter Herman and Albert Appleton, New York Law Journal (11/13/1996); "The Greater Brooklyn Tunnel: Thinking Big Again" by Brian Ketcham and Carolyn Konheim, Konheim and Ketcham, Incorporated (1996); "Study Backs Tunnel To Replace the Gowanus" by Garry Pierre-Pierre, The New York Times (7/01/1997); "A Tunnel We Can't Afford" by Mark Kulewicz, Car and Travel-Automobile Club of New York (February 1998); "Gowanus Expressway: Trouble Overhead" by Bernard Stamler, The New York Times (12/13/1998); "How To Build Our Way Out of Congestion" by Peter Samuel and Robert W. Poole, Jr., Reason Public Policy Institute (1999); "Study: Keep HOV Lane at Gowanus" by Bob Liff, New York Daily News (3/06/2000); "Gowanus Expressway" by Carlos Restrepo, Institute for Civil Infrastructure Systems (2000); Six Bridges: The Legacy of Othmar H. Ammann by Darl Rastorfer, Yale University Press (2000); "Gowanus Expressway Traffic Primer," New York State Department of Transportation (2001); "Gowanus Expressway Project: Tier 2 Study," New York State Department of Transportation (2002); "Gowanus Expressway Gone by 2020" by Jake Dobkin, Gothamist.com (5/04/2006);"Make Gowanus Go Away: Architects Say Ax the Highway, Build a Greenway" by Jotham Sederstrom, New York Daily News (1/06/2008); "New Plan for Getting Rid of Gowanus Expressway" by Dave Hogerty, Gothamist.com (1/06/2008); New York Metropolitan Transportation Council; Tri-State Transportation Campaign; Bernard Ente; David J. Greenberger; Ralph Herman; Guy Olsen; Jeff Saltzman; Alexander Saunders; Tom Scannello; Morris Shlyaf; Kevin Walsh; Douglas A. Willinger. I-278 and NY 27A shields by Ralph Herman. Gowanus Expressway exit list by Steve Anderson.